The Australian Anarchist Centenary Celebrations occurred from 1 to 4 May 1986 in Melbourne, Australia. Preparations to celebrate the centenary of the formation of the first known anarchist organisation in Australia commenced in August 1984 by the Libertarian Workers for a Self Managed Society (L.W.S.S.) 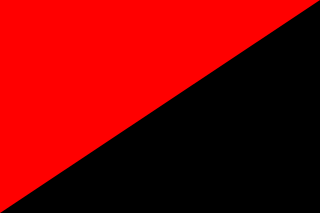 The Melbourne Anarchist Club was formed on 1 May 1886 and included David Andrade, John Arthur Andrews, Monty Miller and Chummy Fleming. The Centenary Celebrations were used by some anarchists to rebuff the negative connotations placed on the word "anarchy". Anarchy is a bogy word: we are coming out of the closet, as it were, to show that we do not have horns or tails. We are simply Australians who have a different philosophy of life. We don't believe in Big Government: in fact, we don't believe in government at all. Government, any government is based on violence and power. If you don't believe it, just look at your headlines over the past few weeks. Anarchy doesn't mean bombs in the street or supersonic bomber raids, it means 'without rulers'. Anarchy means voluntary co-operation and self-management, equality, shared economic decision making. The Centenary celebrations included a May Day march on 1 May of about 400 people, including several large puppets and many banners, and several visiting anarchists from Japan, Korea, Hong Kong, United States, England, France and Spain. Over the weekend several events occurred including banner, poster and historical displays, a two-day conference held at RMIT and Melbourne University, and a picnic in the Royal Botanic Gardens, Melbourne. In conjunction with the conference, a two-day anarchist film festival was held featuring films such as All our lives, a history of Mujeres Libres told by the women themselves; We Aim to Please, a short Australian film on gender politics; Liberty My Love, an Italian anarchist film; Harry Hooton about an Australian poet; and Elsie: a study of a collective about a Sydney women's refuge; and many more. After the Anarchist Centenary Celebrations, the Anarchist Media Institute was established by Dr Toscano and other Melbourne anarchists to increase the media profile of anarchists and Anarchism in Australia and correct bias and misconceptions about anarchism in the media. Colin Ward was a British anarchist writer. He has been called "one of the greatest anarchist thinkers of the past half century, and a pioneering social historian." Lucy Eldine Gonzalez Parsons was an American labor organizer, radical socialist and anarcho-communist. She is remembered as a powerful orator. Parsons entered the radical movement following her marriage to newspaper editor Albert Parsons and moved with him from Texas to Chicago, where she contributed to the newspaper he famously edited—The Alarm. Dr Joseph Toscano is a medical practitioner, a broadcaster and an anarchist who lives in Melbourne, Australia. He has become widely known as an anarchist spokesperson for the Anarchist Media Institute through his broadcasting on community radio, his frequent letters to newspapers such as The Age and Herald Sun and his initiation of community campaigns. He was married to Ellen Jose. Dyer Daniel Lum was a 19th-century American anarchist, labor activist and poet. A leading syndicalist and a prominent left-wing intellectual of the 1880s, Lum is best remembered as the lover and mentor of early anarcha-feminist Voltairine de Cleyre. Benjamin Ricketson Tucker was an American 19th-century proponent of individualist anarchism which he called "unterrified Jeffersonianism" and editor and publisher of the American individualist anarchist periodical Liberty.